In the 1960s many of our Victorian and Edwardian engineering masterpieces were demolished. Fortunately some survived, the Giants of Brede offer a chance to return to the ‘good old days’ and see the past in action! Discover Brede’s very own secret Bunker! Glimpse into England’s dramatic past and learn what living conditions were like under constant threat. See how the Country prepared for the Cold War. Nowadays you take it for granted that when you turn on the tap, out comes good quality water, but how is it moved around? We have several engineering masterpieces which can show you how. The heritage site offers the chance to enjoy artifacts from an earlier age. People of all ages come to study the skills of earlier years. The perfect attraction for a group or school visit! Fancy a cuppa? Our Tangye Tea Bar offers light refreshments and the all important range of homemade cakes. Peruse our selection of souvenirs including the unique range of postcards produced by our resident artist, David. 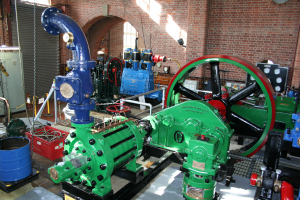 The Brede Water Heritage site offers a fantastic opportunity for Schools and Colleges to tap into a wide range of associated subjects all linked by the common thread of Water. For example, water pumping is merely one element of the Water Cycle. Everyone needs safe water to live by. We ‘borrow’ it from the environment, we clean it, we purify it, we distribute it, we use it and then we return most of it through sewerage systems that lead to treatment works and then back into the environment. It is a truly self sustaining commodity! This initiative could develop into a valuable illustration of ‘hands on’ education at work for children and students. It embraces environmental, technical, scientific, artistic, heritage and social inputs all set within an engineering context. Would you like to be part of it? We can tailor any aspect to suit specific curricula. The story really begins in 1900 when the rapidly growing town of Hastings outstripped its traditional sources of water and the Borough Council was obliged to prospect for new sources further afield. 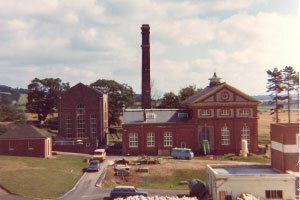 It resulted in a new water treatment works in the Brede Valley and required large steam driven pumps and a pipeline six miles long to take the drinking water to Hastings. Nowadays the provision of safe drinking water into everyone’s home is often taken for granted, but we all need water in order to survive. It is a fascinating story and we would be delighted to tell you more about it using the British Engineering Heritage that is on display. We consider this to be ‘sheer poetry in motion’. 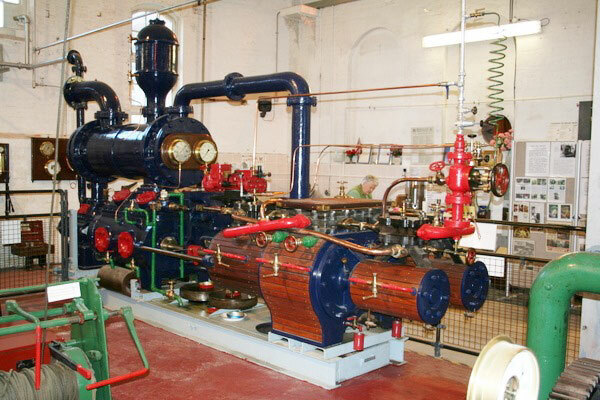 The Society has become the home of the Brede Steam Giants. 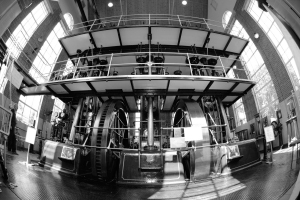 They are huge 35 feet (10.7 m) high water pumping engines that were capable of delivering up to 3.5 million gallons of drinking water every day to the growing town of Hastings. 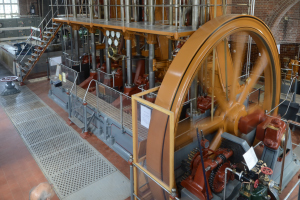 Additionally you can see these engines, and many different water pumps in operation during our public open days throughout the year and our expert guides will be on hand to tell you more about it. 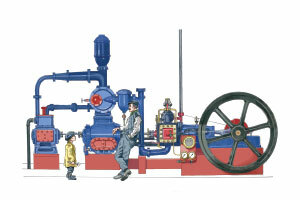 A 410hp triple expansion steam pumping engine built by Tangyes of Birmingham in 1904 and restored to original colours for its centenary. World War Bunker in perfect preserved condition. Beautifully handcrafted Postcards illustrated by our own on site artist. Try your luck with our Tombola, useful prizes to be won. 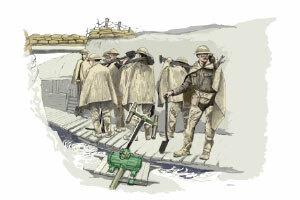 Another engine to a more modern design, installed in 1940 despite the start of the second world war. Numbered 5058 our researches have confirmed it to be the last of its type supplied by Worthington Simpson of Newark and its 420hp is capable of pumping 3.5 million gallons per day to the Fairlight and Baldslow service reservoirs north of Hastings. A range of water artifacts, the collection hails from Folkestone and Dover Water Services now displayed in the old boiler house. Also on view are a wide range of other pumps and equipment, including recording instruments. These emphasize the technology that is needed to bring water from the source to consumers’ taps. The Brede Heritage site is rather special. It tells the story of water supply for the Hastings area from the steam days of 1904. The Giants are huge and reach over 9 metres (30 feet) high. They are located in tall brick engine houses displaying striking architectural features in the baroque and art deco styles. Today, safe water is rather taken for granted, and we aim to tell the Brede story in a friendly and informative way. We offer free guided tours. Visit our Heritage site to learn more about the water you need for life. 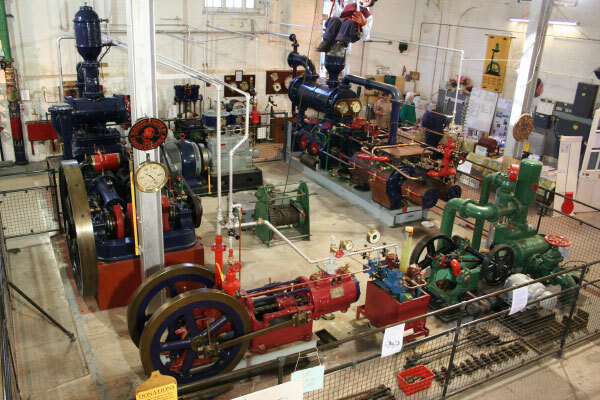 Our Collection of engines will be in operation for you to enjoy and appreciate British Engineering at its best. Come and share our Passion! Open the first Saturday of every month and Bank Holiday Mondays. 10am - 4pm Entry normally FREE ! Light refreshments and homemade cakes are available at the "Tangye Tea Bar".